Big Sky Country. Last Best Place. Treasure State. High Wide and Handsome. Lewis and Clark Country. Land of the Shining Mountains. God’s Country. Montana has had many monikers. Whatever you call it, Montana is a special place. Our home.And right in the middle of our home lies the finest trout river in the country. The Missouri. The Mo. The Kissouri (Okay, that’s made up, but it is still Kirk’s personal favorite). Just like Montana, whatever you call it, the Missouri is the best. We know it. We breathe it. Now we want to share it. If you have been here, you already know. If you have never visited, it is a must for your bucket list. The Missouri River is truly one of the finest rivers in the country to fly fish. We can say that with confidence, because we have tried many of them. Consistently, nearly year round, you can find trout. Often, rising fish. 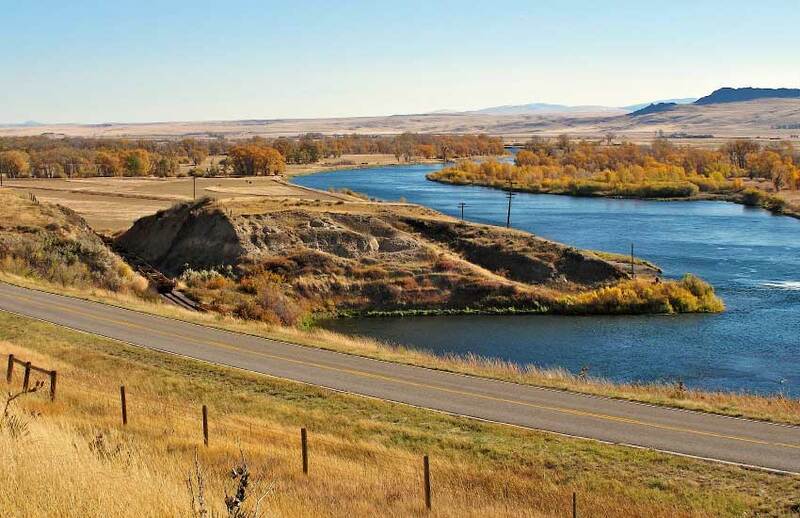 Lewis and Clark named the Jefferson, Madison and Gallatin rivers after President Thomas Jefferson, Secretary of War James Madison and Treasury Secretary Albert Gallatin. The three officers converge near Three Forks, Montana to form the Missouri. After flowing through several dams, the river becomes one of the finest tailwaters in the country. After coursing through the canyon below Holter dam, and just upstream of Cascade, the Missouri leaves the Rockies and flows out onto the high plains of northern Montana. This is where the tailwater starts. Although crowded at times, you will find a lot of fish. The annual estimates range from 5,000 to 8,000 fish per mile. The guides daily take anglers to the Dam and do “row arounds”, consistently plucking rainbows with nymphs. Once you leave the first half mile, the river has consistently beautiful runs, interspersed with a few riffles. Nymphing and dry fly fishing can be terrific. There are basically two floats, Dam to Wolf Creek Bridge, and the bridge to Craig. In total about 8 miles. From Craig, the river flows through what is often called the Canyon. There are five boat ramps and some nice places to pull off the frontage road to wade fish. The twelve miles are similar to the upper river. Runs, with riffles around the islands, give every angler lots of water to ply with your flies. There is really something for everyone. When its windy (we won’t lie, this part of Montana gets a bit breezy at times), the Canyon offers some protection as it winds through the rock walls. We have many trips up there and all of our anglers usually come back with ear to ear grins. This is where the river really comes into its own. Diverse is maybe the best way to describe it. You will find a little more of the canyon, the only rapids on the river (if you can call them that), and some truly great dry fly water. We are a little partial, but we’ve been fishing the whole river for years, and the lower reaches are consistently our favorites. Although sometimes like graduate school, every angler should try this part of the river. With practice, you will be rewarded. The hatches are more consistent, the trout are less hassled, and the biggest fish consistently come out of this part of the Missouri. We don’t think we are dry fly snobs, but our back yard is a really sweet spot to drift your flies over some really spectacular fish.Once you try it, you might just not want to go back upstream. We like it down here so much, we have some area pics to share. This is dramatic, beautiful, rugged country. People fish from drift boats, but don’t forget the wade fishing. The road to Sheep Creek provides a couple miles of excellent foot access. You might find hundreds of fish rising in this area. The big eddy is plied by guides every day, and the hatches can be nothing short of spectacular. Named after the dog kennels near the water, this area provides unbelievable acreage to anchor your boat and wade fish to sipping trout. Truly a unique experience. The Missouri leaves the Canyon at that low point in the skyline on the right. If you don’t stay at the Barn Pool until dark, don’t forget all the great water coasting in to the boat ramp. There are runs, weed beds, islands and channels. All are worth exploring. Stay late. There are no rocks to hit with your boat; you really can float out after dark, like our friend Kelly Canada. Besides, your motel room, restaurants and bars, are all minutes away, since the boat ramp is right below town.